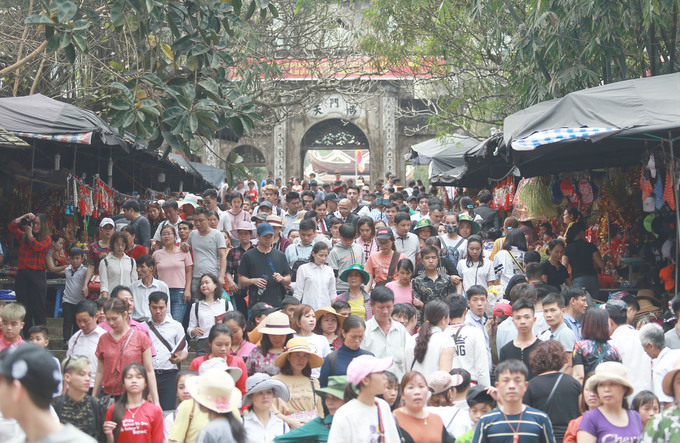 More than 50,000 pilgrims were at the Huong Son complex in Hanoi Sunday, overwhelming roads and cable cars. 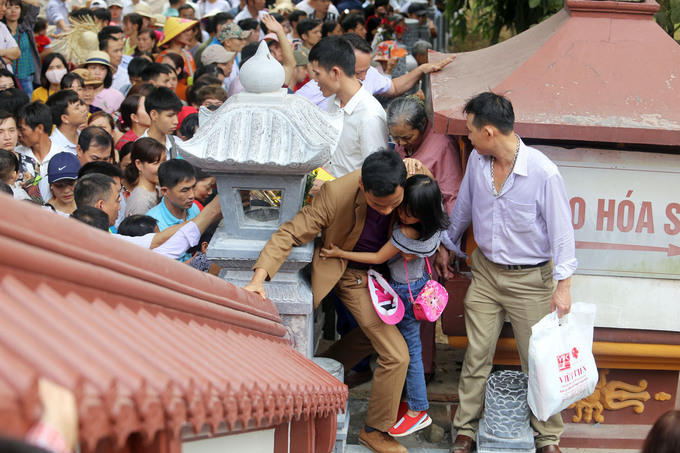 Tens of thousands of devout Vietnamese flocked to the Huong Son complex on Sunday, the first day of the Huong Pagoda festival. 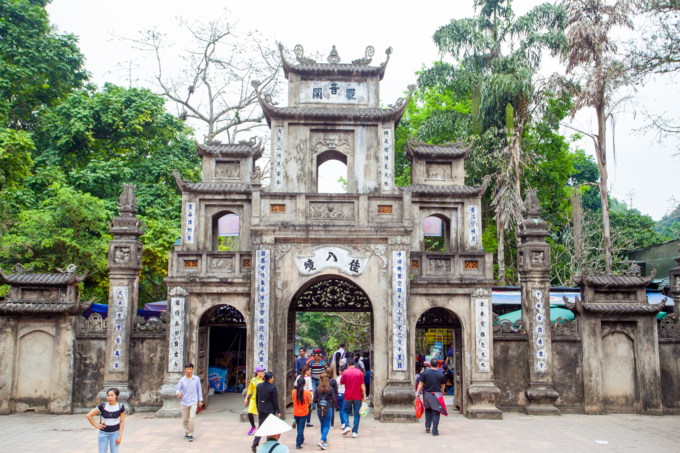 The Huong Pagoda, in Huong Son Commune, Hanoi's rural district of My Duc, is a collection of many temples and pagodas built amidst mountains and forests. 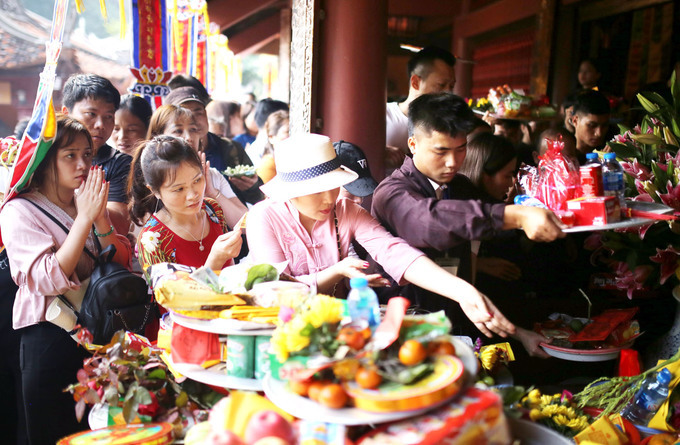 Every year, on the sixth day of the first lunar month, February 10 this year, the three-month Huong Pagoda festival opens. 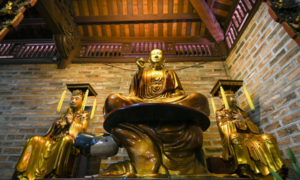 The festival, one of the grandest religious festivals in the country, attracts hundreds of thousands of Buddhists in the early days of the Lunar New Year. From early Sunday morning, the entrance to Thien Tru Pagoda, one of the main pagodas in the religious complex, was overflowing with people. 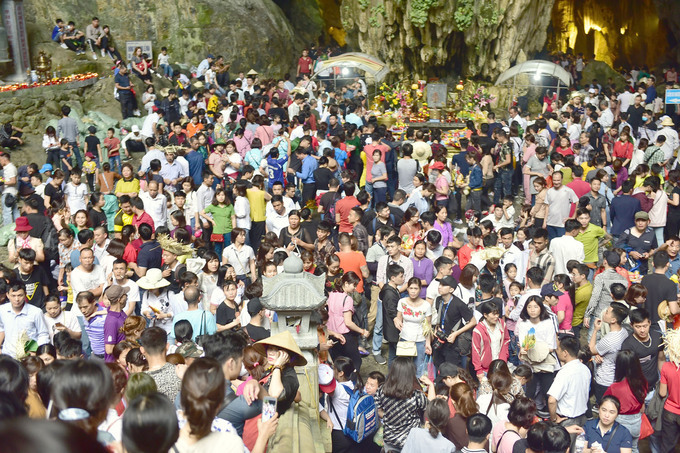 This year, in an effort to ensure security and manage the place better, the organizing committee has not allowed business booths in the temple, caves, on narrow roads and at the Nam Thien Mon Gate. 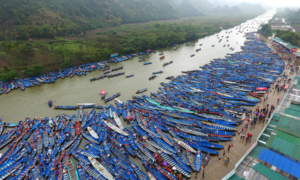 "This year, the festival’s opening day is still a public holiday, and the weather is warm, so the number of pilgrims has increased dramatically compared to other years," said Nguyen Van Hoat, chairman of My Duc district people's committee. 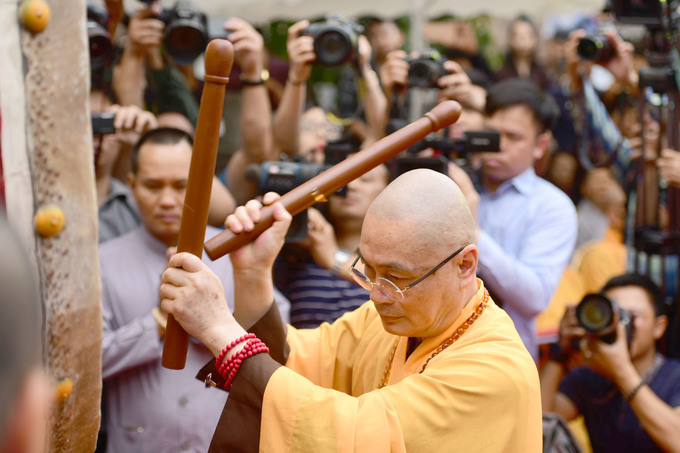 At 9 a.m., Venerable Thich Minh Hien hit a gong to inaugurate the festival. The entrance to Thien Tru Pagoda was obstructed as many pilgrims climbed over the fence to get in. 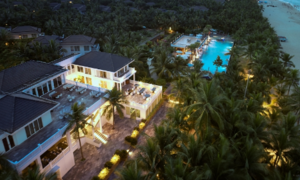 According to the festival organizing committee, more than 125,000 visitors visited the complex from February 7 to 9. On Sunday morning, more than 50,000 pilgrims thronged the sacred complex. Pilgrims prayed and made offerings at the pagoda’s altars, invoking divine blessings, peace and luck for the New Lunar Year. 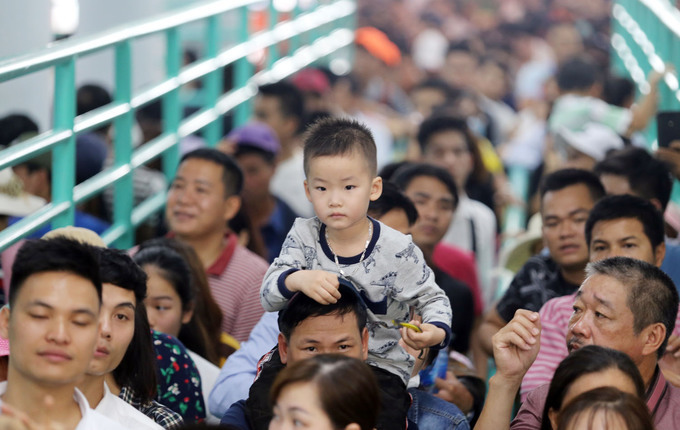 A child sits on his father’s shoulders as people wait in line. 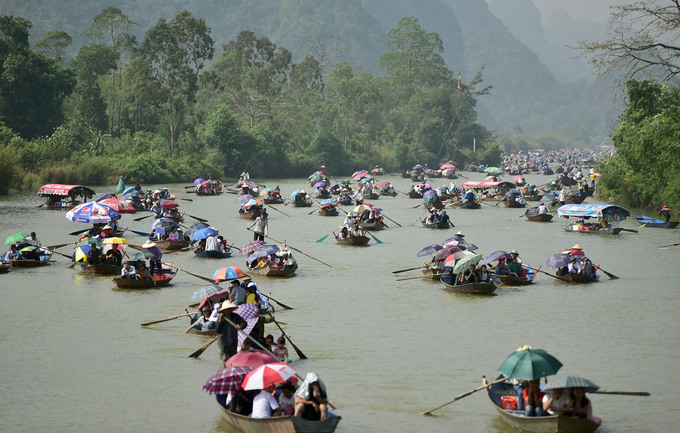 Thousands waited patiently in line for hours in front of the cable car station to catch a car to reach the Huong Tich cave. 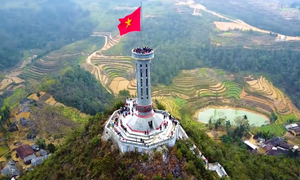 In 2018, the Huong Pagoda festival welcomed 1.4 million pilgrims, ticket sales feteched VND112 billion ($4.8 million). 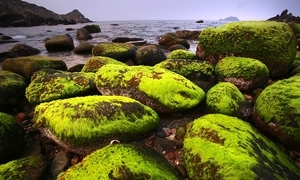 This year, 1.5 million tickets have been printed. The Huong Tich Cave, the heart of the Huong Son landscape, had no empty space Sunday morning. On the entrance to the cave, on a high cliff to the left, five words, "Nam Thien De Nhat Dong" (The best cave in the South sky) are carved. These were the words given in 1770 by Trinh Sam, a Lord from the Trinh family which ruled the country at the time. 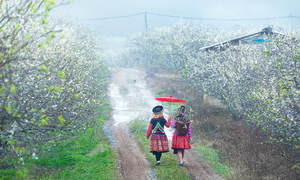 The Huong Pagoda festival lasts from the sixth day of the first lunar month to the last day of the third lunar month, that is, from February 10 to May 4 this year. 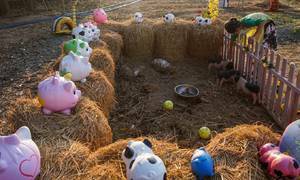 This is the longest Lunar New Year festival in the country.